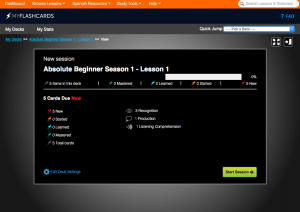 After completing your lesson on the SpanishPod101.com site, you can take a self-assessment quiz to test your knowledge. You can access this quizzes on the 3rd section of your SpanishPod101 lesson, under the Review tab. Once you click the Review link under you lesson, you will see the “Quizzes” and the “Vocabulary Flashcards” tabs.The “Quizzes” tab offers two different options: “Writing Questions” and “Review Questions”. Both quizzes have 5 questions for you to answer, either by writing or selecting true/false options. You can always change the language settings under the “Quiz Settings” tab. The quiz questions will reinforce what you just learned on your Spanish Pod 101 lesson, and although both quizzes are pretty short, they focus on the vocabulary used and will help you remember it. After taking the Spanish Pod 101.com quiz, you can check your answers on the link below it. 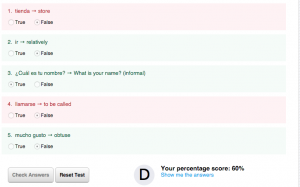 You will be able to see the percentage of correct answers given and your grade right next to it. You will be graded from A to F. You can also click on the “show me the answers” link right below your grade to review what you did wrong and what is it that you need to practice more to improve your Spanish skills. A great way to practice the vocabulary you have learn in the Spanish Pod 101’s lesson is by practicing your Flashcards. Next to the “Quizzes” tab you will find the “Vocabulary Flashcards” tab. Once you click on it, you will be directed to a new screen on the online Spanish learning portal. There is a large bank of Flashcards that you can access and practice with. Once you feel confident about your Spanish vocabulary practice, it might be a good idea to go back to the Quiz section on your Spanish Pod 101 lesson and give it another try. This quizzes are not available on the free version of the Spanish Pod 101 site, so you might want to consider upgrading to the Premium version which I review hereRemember practice makes perfect, and the quizzes are a great way to improve your Spanish vocabulary skills.